The root of herbaceous plant Angelica pubescens Maxim. f. biserrata Shan et Yuan of family Umbelliferae. Sichuan, Hubei and Anhui provinces, etc. of China. Collected in early spring or late autumn. Fragrant, bitter and pungent taste, light benumbing. The thick and big root with oil and strong fragrance. Pungent, bitter, slightly warm; liver, kidney, and lung meridians entered. Dispel wind-damp, alleviate pain, release exterior. Being pungent, bitter and fragrant with the actions of dispersing, eliminating, warming and dredging, it excels in dispelling wind-damp and alleviating arthralgia, and is indicated for all kinds of arthralgia syndrome due to wind, cold and dampness no matter acute or chronic; it is often combined with other wind-damp-dispelling and cold-dispersing herbs such as Fang Feng and Fu Zi soaked in wine, as Du Huo Jiu from Qian Jin Fang. 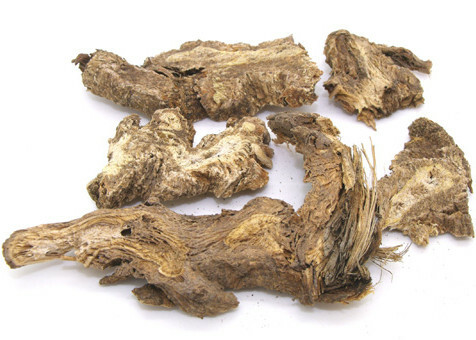 It chiefly enters liver and kidney meridians, moves in descending direction and specializes in dispelling wind-damp from lower portion of the body when compared with Qiang Huo, so it is suitable for pain of waist and legs, paralysis and arthralgia of feet due to pathogenic wind, cold and dampness. For concomitant symptoms such as deficiency of liver and kidney, insufficiency of qi and blood, it is often combined with liver-kidney tonics, blood-activating and blood-nourishing herbs such as Sang Ji Sheng, Du Zhong, Dang Gui and Niu Xi,as in Du Huo Ji Sheng Tang from Qian Jin Fang. Being pungent and warm with the actions of releasing exterior, bitter and warm with drying dampness, it has a similar but moderate effects to that of Qiang Huo, so it is suitable for headache, heavy head, general pain of the body caused by affection of exogenous wind-clod with dampness, and often combined with other wind-cold-dispersing herbs such as Qiang Huo, Gao Ben and Fang Feng, as in Qiang Huo Sheng Shi Tang from Nei Wai Shang Bian Huo Lun. In addition, it is also indicated for dermal pruritus by means of oral administration or external washout because of the actions of dispelling wind and removing dampness, headache and toothache for reason of the actions of alleviating pain. Decoct 3~9 g. Proper dosage is for topical application. Being pungent, fragrant, bitter and dry, it can easily damage yin and body fluid, so it should be used cautiously to treat patients with usual constitution of yin deficiency and blood dryness.